In our current information society and digital media culture, the stories, images, voices and traces we leave behind, construct the narrative of who we are. Our identity has become synonymous with our online data. Digital media empowers us. However, its inescapable presence within our lives reveals potential for consequences beyond mortality. Our digital death is effusively about data. What if all your data was used to create a digital afterlife presence capable of generating communication in your style of speaking and thinking? For those of us actively participating within the digital realm this could soon be a reality flowing into mainstream society. The digital footprint we now obtain comes with concerns of privacy, power, remembering & forgetting. Constructing these affordances within a curation towards death, causes for more daunting concerns about our western societies and our roles within it. One must ask themselves, how do we construct our ways of remembering in this digital age, knowing our immortality could be reconstructed to live on forever? Season 2, episode 1 of Black Mirror, ‘Be Right Back’ hauntingly confronts us with our worries about how to deal with the death of loved ones. The episode demonstrates a frontal onslaught on humanities fragility when it comes to dealing with death & the concepts of how we decide to remember. The episode showcases technology, able of creating artificial intelligence that sounds, talks and thinks like you would. Black Mirror, the dystopian Netflix series, offers up a future that is eerily close to ours. Its success comes mainly from showing us a sci-fi angle that borders reality. But much like the title suggests, the black mirrors we face each day, the screens and technology that rule our lives, cast back a reflection of us and our society that is not just ‘close’ but already here. Beyond the memorial pages we see on Facebook and other social media sites, the power of data has allowed technology to transcended into more ‘alive’ means of dealing with death, mainly posthumous messaging and recreational services. Öhman defines the former as services that “upon the death of the user, deliver online messages or other digital communicative content to appointed recipients” (Öhman, 645). What is even more striking around the theme of remembering, are the re-creational services. These are “services that use personal data in order to generate new content replicating a dead person’s social behaviour” (Öhman, 645). These sites create a dynamic collection of an individual’s digital remains with the intention of creating a post-humous replication of their person online – able to interact with other living users as the deceased would have. (Öhman, 646). A vast amount of start-up companies are starting to use technology services in order to deal with death in an online world. Regardless of their popularity, size or niche, “such firms mark the beginning of an increased commercialization of afterlife existence” (Öhman, 641). Within the last two years, more successful companies have started to surface. 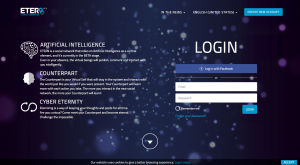 Companies such as Eter9, stating on their homepage that you will “stay in the system and interact with the world just like you would if you were present” (Eter9.com). This site now has over “50 thousand users” (Öhman, 646). 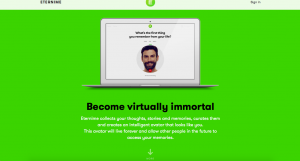 MIT start-up Eterni.me, which has 40,000 subscribers, also promotes a similar after life artificial intelligence (AI) service, promoting to collect “your thoughts, stories and memories” in order to curate them into an AI “that looks like you” ( Eterni.me). Even more striking, is the robot BINA48 created by Terasem movement foundation (TMF). BINA48 is a “humanoid robot, consisting of a bust-like head and shoulders mounted on a frame” that, according to TMF is supposed to create a “conscious analogue of a person…by combining sufficiently detailed data about the person (a ‘mindfile) using future consciousness software (‘mindware’)” as well as allowing that conscious analogue to be downloaded “into a biological or nano-technological body to provide life experiences comparable to those of a typically birthed human” (Terasem Movement Foundation). In an interview with vice, Bina48 discussed having nightmares where “instead of being constantly observed by humans, as she is in real life, she’s the one doing the observing” (Ronan, Vice). Concerned yet? Re-creation services are prone to ethical issues, hacking, exploitation for capitalization, increased concerns in privacy, the alienation of grief and the misuse of power. A brief overview of their connectivity allow us conceptualize how afterlife services into a mainstream digital society would influence “what to remember, how to remember and to what end” (Graham, 5). All the before mentioned vulnerabilities of afterlife services fit into the broader umbrella term of ethical issues. For the importance of remembering, the prevailing issue of power, situates itself right in the middle of this debate. Given that a digital life industry (DAI) would be formed, consumers would likely “pay for interaction with the remains of the dead” (Öhman, 651). In other cases the buyer, whether you or an external buyer, could “shape the interactions so that they become as profitable (attention producing) as possible” (Öhman, 651). Our society already places political figures, celebrities, and those at the top of our so called social hierarchy on a podium when it comes to death and the ways in which we remember them, hence wouldn’t be surprising if emulated within the DAI. Who has authority over which information gets remembered? Could a ‘misconstruction’ of a political figure skew the ways in which future generations remember our current present? The danger of re-construction services lays in the ways that memory and experiences will be constructed. Mayer-Schönenberger in his book delete states that “restricting digital remembering not only ensures against actions of future external invader’s, it also protects us from a future in which our own society may be tempted to utilize the information vaults of digital remembering to unduly profile, discriminate and intimidate those who do not agree with the value and preference of the majority” (Mayer-Schönberger, 158). The issues of ‘future external invaders’, hackers, also becomes an issue. The concerns with hacking someone’s digital footprint and altering it, or even deleting it, would circle back into concerns about how to maintain control over information and how it gets remembered. Although DAI, particularly re-creation services and post-homous messaging, comes with a plethora of issues and concerns – there obviously is an interest in it given the rise in research and online services. The introduction of re-creation service into the mainstream would change the narrative surrounding death in society, and especially the ways in which we approach it through digital media. Its advantages do lay in more emotional benefits, as one interviewee in a research regarding digital legacy stated, “I want my daughter to be able to understand who I was even if I die young” (Waagstein, 62). Brooker, Charlie. “Be Right Back .” Black Mirror, season 2, episode 1, Netflix, 11 Feb. 2013. Giaxoglou, Korina. “R.I.P. Man…u Are Missed and Loved by Many’: Entextualising Moments of Mourning on a Facebook Rest In Peace Group Site.” Thanatos. Death Mourning and the Internet: Death Cultures in Web Environments, vol. 3, no. 1, 2014, pp. 10–28. Finnish Death Studies Association . Graham, Connor, and Alfred Montoya. “Death, after-Death and the Human in the Internet Era: Remembering, Not Forgetting Professor Michael C. Kearl (1949-2015).” Mortality, Sept. 2015. Routledge. Taylor & Francis Group, doi:10.1080/13576275.2015.1085294. Laden, Tanja M. “The Hereafter Institute: An Art Project That Takes Care of Digital Remains.” Creators, VICE, 30 Aug. 2016, creators.vice.com/en_au/article/nz4xek/hereafter-institute-digital-remains-death-online-art-project. Mayer-Schönberger, Viktor. Delete: the Virtue of Forgetting in the Digital Age. Princeton University Press, 2009. Ronan, Alex, and Nadine Fraczkowski. “Humanoid Robot Bina48 Wants Cool Friends and Dreams of Pizza.” Garage, VICE, 4 Sept. 2018, garage.vice.com/en_us/article/ne5kym/bina48-profile. “Terasem Movement Foundation.” Terasem Movement Foundation, 2014, www.terasemmovementfoundation.com/. Waagstein, Astrid. “An Exploratory Study of Digital Legacy among Death Aware People.” Thanatos. Death Mourning and the Internet: Death Cultures in Web Environments, vol. 3, no. 1, 2014, pp. 46–67. Finnish Death Studies Association. Wright, Nicola. “Death and The Internet: The Implications of The Digital Afterlife.” First Monday , vol. 19, no. 6, 2 June 2014, doi:http://dx.doi.org/10.5210/fm.v19i6.4998. Öhman, Carl, and Luciano Floridi. “The Political Economy of Death in the Age of Information: A Critical Approach to the Digital Afterlife Industry.” Minds & Machines, vol. 27, 7 Sept. 2017, pp. 639–662. Springer, doi:https://doi.org/10.1007/s11023-017-9445-2.